Yucca Bright Edge is an easy to grow evergreen perennial plant. 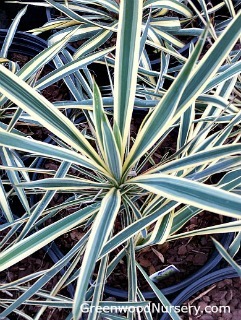 This yucca filamentosa has strong evergreen foliage that can withstand heavy snowfall. The sword-like blades are green with creamy yellow edging. From early to mid-summer 3 to 4 foot flower stalks pop up producing creamy white flowers that hang like tiny ornaments. This native perennial adams needle plant grows 2 to 3 feet tall in full to part sun with a spread of up to 2 feet wide. The low water needs of the Bright Edge Yucca make it an excellent choice for rock gardens, firewise landscapes, xeriscapes, container gardens, and edging patios. Mate your Bright Edge Yucca with the Color Guard Yucca. Dig a hole about 3 times as wide as the root plug and 2 times the depth. Fill hole with water. Water should quickly drain out within about an hour, otherwise the area is too wet for this yucca plant. Plant so that the top of the root system is about an inch higher than the soil level. Allow this top part of the root system to dry out before watering again. When watering, apply approximately 1 inch of water or water the top 1/3 of the soil when dry. Water weekly during spring, summer and fall. Plant in well drained to dry soil areas. During winter, water monthly if no rainfall. Great for planting in containers with drainage holes.